It's no secret that we're pretty big fans of NECA here at Infinite Earths. Especially when it comes to their Alien and Predator lines! We're just such huge fans of these classic franchises and feel no one has captured the characters and creatures from these worlds quite like NECA has. Needless to say, our devotion to these lines gets kicked into overdrive with each new addition that gets announced, but none get us more pumped as those special figures set aside for release at San Diego Comic Con! From the Ahab Predator to the Albino Predator, NECA has always brought out the big guns for their convention exclusives, and this year was no exception! 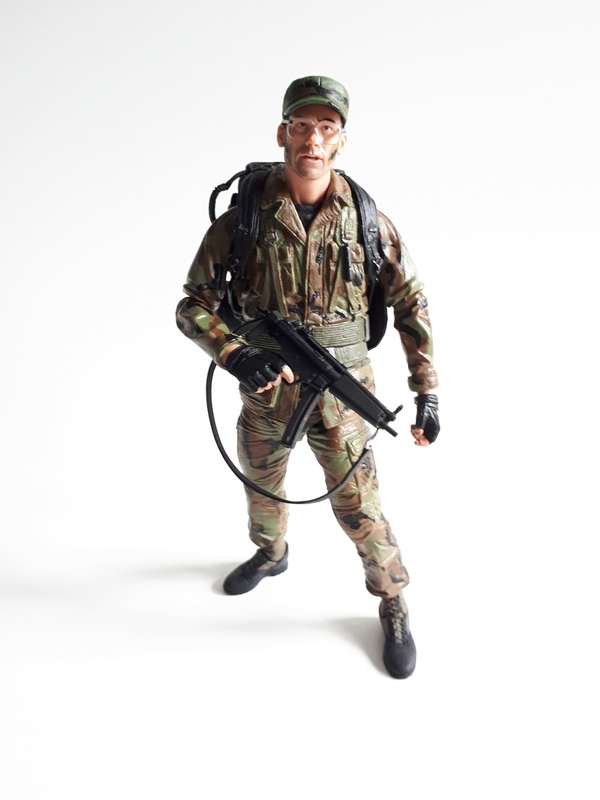 Back in May, NECA unveiled Rick Hawkins, a 7" action figure based on Shane Black's character from the original Predator movie released back in 1987. This unexpected piece would serve as the final addition to the 30th Anniversary Predator collection, and was the perfect way to cap off an already impressive assortment of action figures. Rick Hawkins was a mercenary and a member of Dutch Schaefer's private military team. 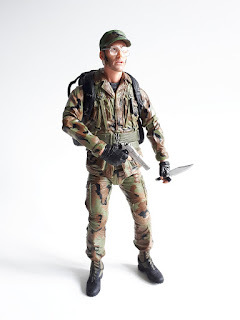 In 1987, the group was hired by the CIA to head deep into the jungles of Val Verde on a rescue mission, but after learning that it was nothing more than a set up to dupe them into eliminating the rebels in the area, Schaefer's squad came into contact with a lone Predator that stalked and killed each member of the elite military team one by one. Hawkins, the team's youngest member, and their communications specialist, was the first member of the team to be killed by the Predator. This Comic Con exclusive figure comes to fans encased in the same style anniversary packaging that we've been seeing on NECA's Predator releases over the last year - with the figure clearly displayed alongside his included accessories in the plastic window at the front, red foil lettering, anniversary badging, and promotional images of the figure dominating the front, back and sides of the box. Other than a new quote from the film featured on the back of the box, there really isn't anything new to say here about the packaging. Despite this, we must admit that we still love it as much as we did the first time we laid eyes upon it, and would love to see this collector friendly packaging carried on throughout the line in the future. As for Hawkins himself, this is an extremely solid addition to the line! Looking as though he stepped right out of the film, NECA has equipped their figure with a stunning likeness to Shane Black as he appears at the beginning of the movie. The figure comes dressed in the same military fatigues seen on screen, made up of varying shades of green, black and brown. Also included on the figure are a matching cap in the same color scheme as the main outfit, combat boots and a green belt girded around his waist. The overall sculpt is very impressive and features multiple wrinkles and folds moulded into the outfit, along with a nice selection of pockets situated throughout. 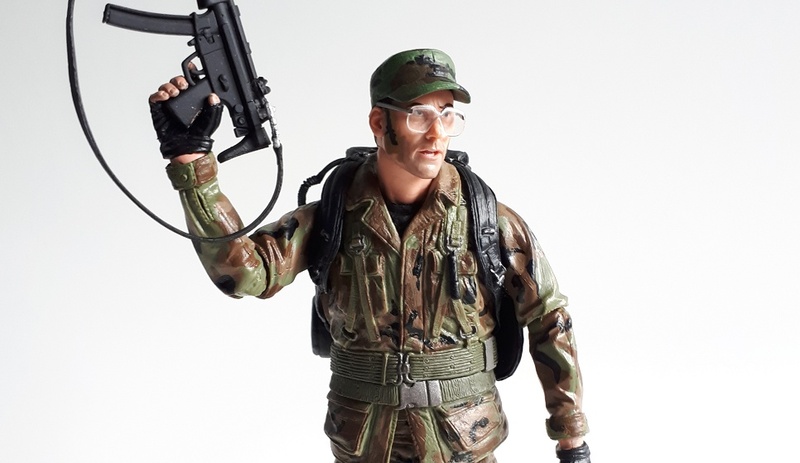 Fingerless black gloves, a small amount of camo facial paint and individually sculpted glasses complete the overall look of the Hawkins figure, and we must say that seeing everything that NECA has done in person is downright staggering to behold! Additionally, NECA has also included a black backpack on the figure. 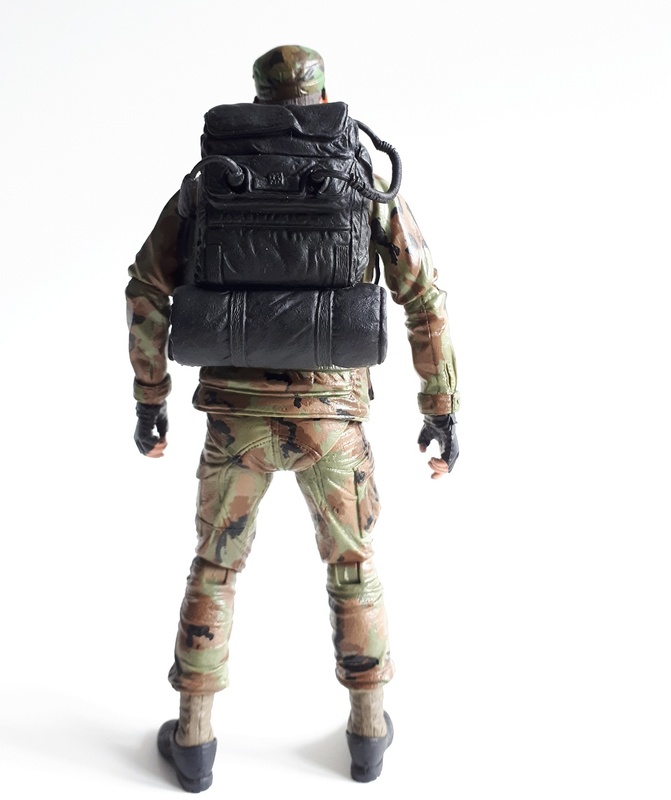 Like the figure itself, the backpack features a nice level of sculpted detail and even includes some pockets that will allow fans to store the smaller accessories included with the figure. The piece also includes a soft plastic chord resembling what was seen on screen and reminds collectors that Hawkins was the communications specialist of Dutch's military team. The chord is made of a slightly softer, more pliable plastic and really adds something extra to an already impressive piece - however, we would caution our readers to be mindful not to snag the chord while posing so as to avoid the risk of accidental breakage. As an added note, as far as we can tell, the backpack is not removable! Some fans seem to be under the impression that it could be removed if you find yourself so properly motivated, but this just doesn't appear to be the case, and we're really not willing to try and run the risk of damaging the figure in the process. Additionally, a shoulder holster is also included with the ensemble. Looking near identical to the one used by Hawkins to carry his sidearm on screen, it cradles the included pistol accessory nice and snuggly, and offers an appropriate storage area for the weapon when not in use. Now, as if the sculpt on this figure wasn't already impressive enough, we have to take a moment to comment on the paint work! The applications are incredibly strong, made up of crisp lines and even coats that really pop in person. However, this is most evident in the case of the camo patterns making up Hawkins' fatigues - everything is so neat and evenly spread, with not even the tiniest issue in regards to smears, splotches, runs or even general sloppiness. Now, in our experience, NECA has always been at the top of their game when it comes to paint applications, but they've really raised the bar with this new figure - and it shows! Hawkins also comes loaded with articulation for a variety of posing options. 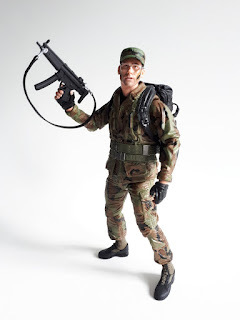 NECA has engineered movement into multiple points on the figure, including the head, shoulders, arms, elbows, wrists, midsection, waist, thighs, legs, knees and ankles. Each point holds strong and moves rather smoothly, and we've no doubt the joints will continue to hold strong even years down the road. We've never once had a joint issue when it comes to NECA products, and this streak continues with the new Hawkins figure. There are no loose or sticky joints to speak of, and most desired poses can be pulled off with relative ease. Now, we will admit that the addition of the backpack does hinder the movements of the shoulders and arms of the figure ever so slightly. However, as we really like the addition of the accessory, this is far from a gripe, and something we just felt was worth mentioning to our readers. Additionally, while our figure had no issues with sticky or stuck joints, we do feel that this is something the figure could suffer from. And so, should you come across any stuck or sticky joints, be sure to use a blow-dryer to loosen things up a bit. After all, the last thing we're sure our readers want to do is snap off limbs while posing or enjoying this new figure. Just a bit of a heads up for you all! To go along with this impressive figure, NECA has also included a nice selection of accessories aside from the aforementioned backpack. First up, we have a Bowie knife. This fixed-blade fighting knife is a staple of most special military units, and looks very similar to the weapon carried by Hawkins in the original Predator movie. It's mostly made up of a grey colored plastic, and is meant to be used in the left hand of the figure- mostly because the right hand has been shaped with the specific purpose of holding both of Hawkins' included guns. The knife fits loosely in the figure's hand, but it does the job well. Additionally, if you so desire, there is a pocket moulded into the figure's backpack that fits the knife rather well. 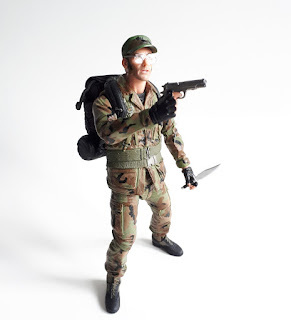 Aside from the knife, NECA has also loaded up Hawkins with a nice selection of firearms. First up, we have the IMI Desert Eagle Mark I pistol. This popular sidearm is seen being carried by the likes of Billy, Dutch, Mac, Poncho and Hawkins in the film, and the included accessory has a very nice level of detail - including a very cool textured grip. The accessory can be stored within the included shoulder holster, and is meant to be used within Hawkins' right hand which, as we mentioned before, has been sculpted with the specific purpose of holding either of the two guns included with this figure. Rounding out the small arsenal included with Hawkins is the very impressive HK94 submachine gun. It features a soft shoulder strap and is made up of a mostly black plastic. Interestingly, the guns seen in the film were meant to be MP5A3s, but a closer inspection of the weapons reveals that they are in fact civilian HK94s with the 16" barrels chopped down and converted to full auto. In any case, the submachine gun is a very nice, and appropriate piece to include here, and we're glad that NECA didn't skimp out in the accessory department. In short, we are more than impressed with the San Diego Comic Con exclusive Rick Hawkins figure! NECA has once again knocked another convention exclusive out of the park, and unleashed something truly unexpected upon Pred Heads across the globe! We have absolutely no complaints here, and must applaud the artisans at NECA for once again bringing out the big guns for their Predator line! In the years since we started Infinite Earths, we've begun seeing Randy Falk and the team at NECA as a group of fine folks capable of making miracles happen! And the release of the Rick Hawkins figure just cements that view to us even more! Perhaps one day, more members of Dutch's elite military team will get the plastic treatment, but even if they don't, this latest convention exclusive stands as testament to the fact that the team at NECA never give up in their ever growing quest to give the fans what they want! 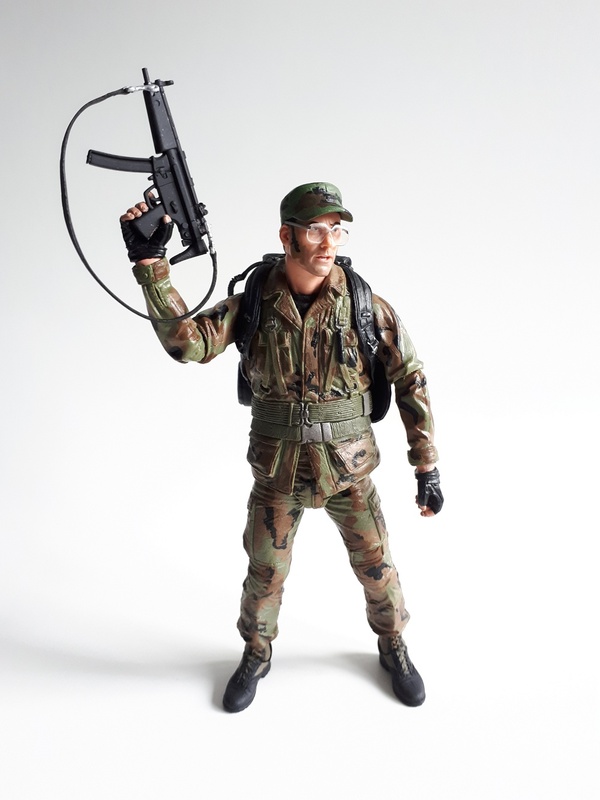 Kudos, to NECA for yet another solid piece of plastic that not only caps off a year long 30th anniversary celebration in honor of John McTiernan's iconic 80's actioner, but proves you should never stop believing - even in the impossible! 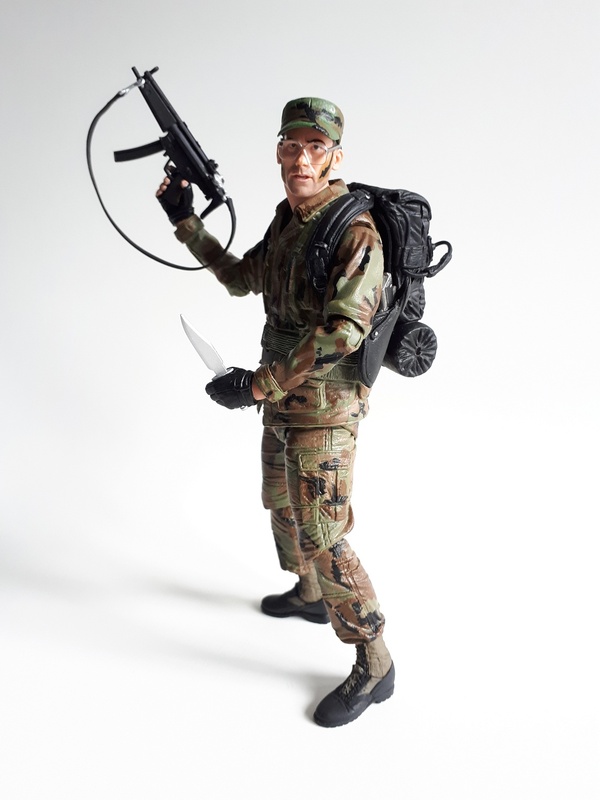 Overall: "NECA unleashes another strong entry within their Predator line, and gives fans one of the best San Diego Comic Con exclusive we've gotten to date!" - Special thanks to Randy Falk over at NECA for sending the sample used in this review! And to Katie Passfield for taking the pictures used in this review!